Hello and welcome to Garden Thursday with Virginger. Our weather has had its ups and downs. Over the weekend it was all cool out, now it is nice and warms again. So mum and the boys have open windows. So what is happening outside? Well the red-twigged dogwood has leafed out nicely. The whitish and green leaves make it a bright spot, even on a cloudy day. Mum planted three to hide the corner of the neighbor's yard where the dogs used to do their bizzness. They have both gone to The Bridge and no new woofies are expected! The allium's are blooming just fine. Most of them are purple, but a few of them are white for some reason. The pee-o-knees have flower buds so we should have blooms really soon. This one is white with a bit of pink. This one is dark pink. Me, well once the snoopervising of the chores was done, I had to make sure mum got her dinner cooked all nicely. 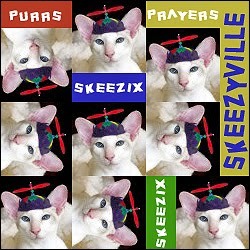 Plus we want to give a shout out to Skeezix. He had his operation and sadly he has all sorts of cancer inside of him, too much to take out or treat. His beans and brofurs are all sad, so if you haven't sent them some comforting purrs and love, please do so. 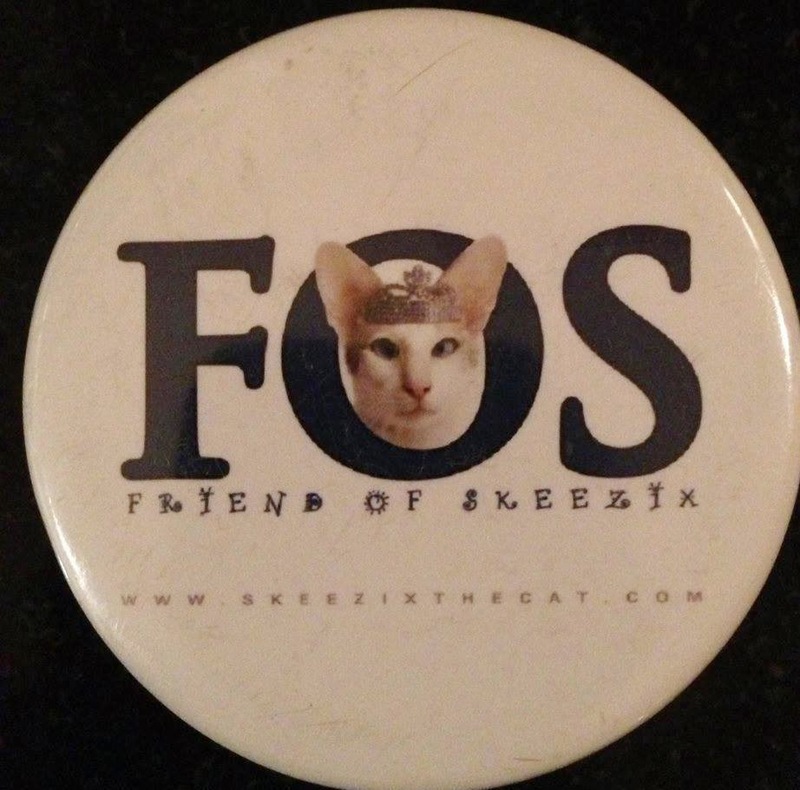 We are proud to be FOS, Friends of Skeezix. 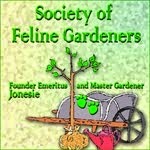 That is all for Garden Thursday. 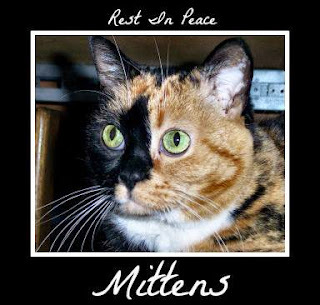 First we need to send lots of purrs to some ailing kitties. No fun when any of us are sick or having to undergo serious treatments. First Skeezix, the Cat Blogosphers very own fashionista. He always brings a smile to our faces, but the VET is going to have to explore his insides today because of a toomer. 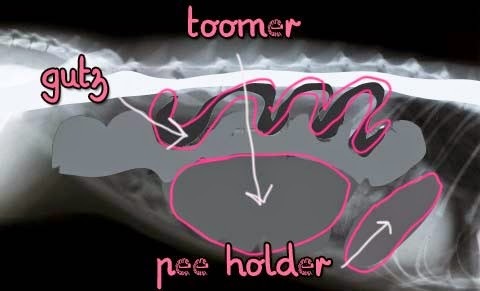 He even posted his Xray and interpeted it for us non-medical types. We hope that all goes well and he is back on his paws really soon. 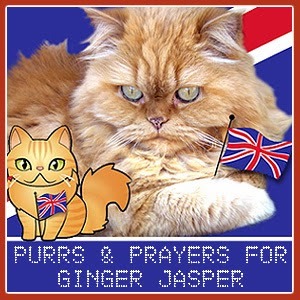 Then another Gorgeous Ginger, Ginger Jasper, is feeling poorly again. Once before he wasn't eating much and he pulled through. So we have to get purring again that he start to eat more. Little Isis had to see the vet this weekend too for a recheck on her bloods and clotting. Uncle Mo, Not The Mama, posted this on Facebook. Me, Derby, well, at least I take the medicine the vet man gave mum. It is a gel and I lick it all off her finger. It tastes pretty good. Mum has only found two smaller spots where I have made a return deposit in the past couple of days. Overall, I don't feel bad. The day didn't start out the best for me, Derby. I was happy mum gave us some gooshy foods, but she put pink sprinkles on mine. Yep, she gave me a Mickey and took me to the stabby place to see Dr Vet Man. Buh-bye Derbs! See you later, have fun. I wandered a bit before I got examined. Mum is worried cuz I have lost two pounds this past year and I seem to be yakking up more. So I think I am getting some stuff to move things through my system, to make sure no build up of hair that might be blocking my tummy. If that doesn't seem to work, then mum says I am gonna have to get my bloods stolen to see if something is out of balance. All done and back in the PTU to come home! Plus I gots some ham when I got home. But then mum went outside to work, then took off for the Ducky Derby. What is that? 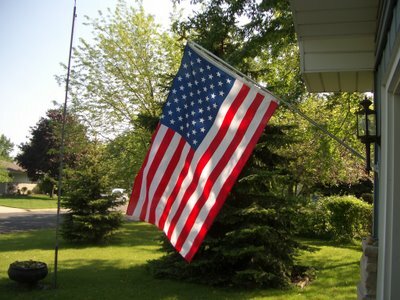 Well, seems they have been having this for six years in our honor. Well, maybe not our honor, but they named it after us! Our two rubber duckies that mum picked out for us. We can win green papers and they even pay for last place. Some of the sausages took the afternoon off to come out and hang out here for the race. A whole lotta duckies ready to get dumped into the river. The finish line. Mum has a video, but blogger keeps giving her an error when she tries to load it. So, we will work on that and try to get it to load. Mum hasn't been able to get the video to load here, she did post it on Facebook if you know her there. We say farewell to another long time furiend. Mittens Pollypaws was helped to The Bridge yesterday afternoon. She had been diagnosed with stomach cancer over three years ago. 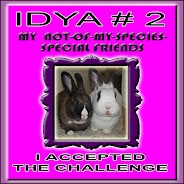 She joins her sisfurs Patches Lady and Mistrie Rose at The Bridge. Please go and leave some comforting purrs for her mum CalicoMom Toni and little sis Precious Flower. We know they have had a sad year this year, so we send lots of comforting purrs to them. 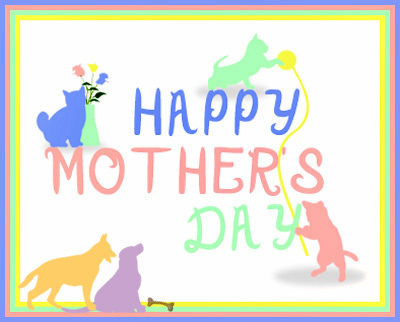 We hope you enjoy chasing the fairies with your sisfurs. We will miss you, but always remember you. Hello and Welcome to Garden Thursday with Virginger. Goodness, how time is moving on! It is already Memorial Day weekend coming up. Mum needs to get some flowers to plant in pots outside, really soon. I will need to get on her about that. This is our crabby apple tree from outside, pretty much in full bloom the other morning when mum went out to take pictures. This is the view we get from inside from mum's sleepy spot! Nice and pretty to wake up to in the morning. Sadly, the blooms don't last long, specially on rainy and windy days like we are having. Lots of pink confetti on the ground. 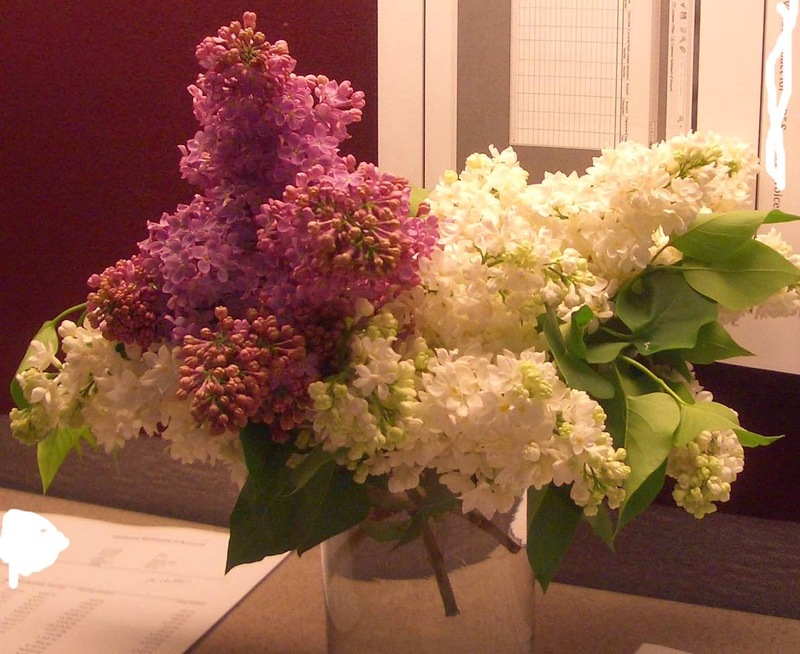 Mum cut off some lilac's and took them to work with her to enjoy while she day hunts. They smell so pretty but they don't last very long once cut. Some of our special fevver furiends, Mr and Mrs Baltimore Oriole. They are so fun to watch when they come to the feeder. Plus they stand out so well in the trees. Me, since it is cool and rainy outside, I even came in for a long nap with Derbs. Just catching up on what we need to bug mum about. So that is the garden report for this week. HiYa, Ducky here. Another week starts, we had a good weekend, we hope you did too. We had warms and the windows were wide open for whiffing! Mum was so bizzy cleaning, laundry shuffling and such, she didn't take pictures of us. She did however see a new fevver she has never seen afor on Sunday. 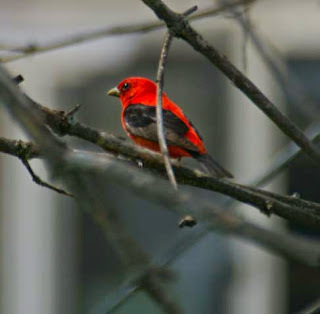 Mum says it is a Scarlet Tanager and while she took it a bit easy on Sunday afternoon, it came by and sat in the tree for a bit. Mum was trying to get fevver pictures, so she had the fancy flashy box outside with her. The one with the big zoomer lens, so it looks all close. 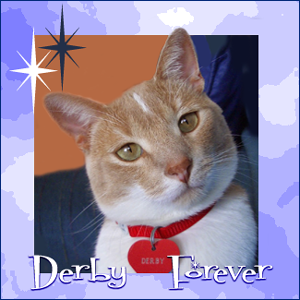 So Derby and I napped a lot inside by the open windows, mum was outside with the flashy box and her book. Not a bad day overall. Hi Ya, Ducky here. It is a wonderful day. Getting all warms, the windows are open. We are enjoying window whiffs and hearing the fevvers sing. So here we are enjoying the window together. Not often that happens, we like our space from each other. Matter of fact, Derby was so crabiliated on Friday AM he was hissing, chasing and just being a totally Sassy Boy. Mum has gone nuts cleaning today. She did the usual laundry, then all of the little rugs around were taken outside and shaken off. Then down to the dungeon to be washed in the washer machine. The the sucking monster was out, and really going into the little places that don't often get cleaned super well. Then mum brought out this little green monster, so she could clean the carpet spots where Derby yak'd all over them. He certainly does yak a lot. I don't, so that makes Mum happy. Derby figures he will just sit on the newly cleaned bed and watch mum work hard to clean up after him. But with all of mum's cleaning it will take us days to get this place properly furred up again. She even washed our little donut beds. 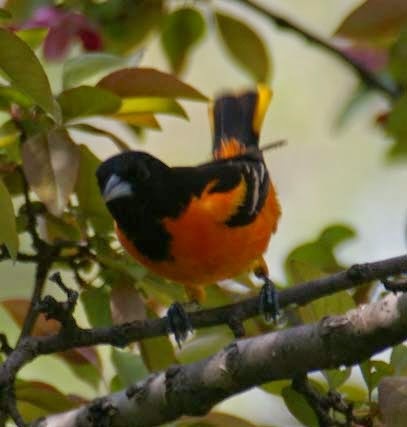 Plus we finally got a picture of the Oriole at the feeder. 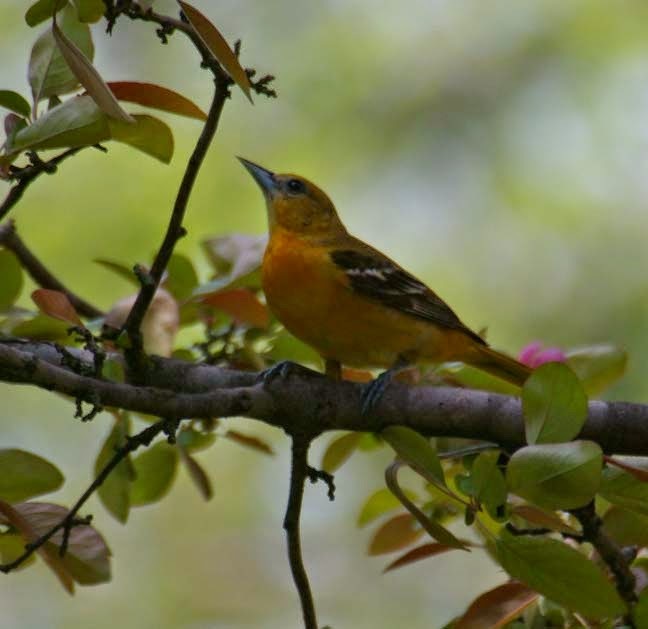 We have been hearing them sing and knew they were back, but we like seeing them as well. Time that the fevvers going north for the summer are coming through. We hope you had a nice Caturday. Oh yeah, we have a horsie race to watch soon too. Hello and welcome to Garden Thursday. It is I, task master Virginger, reporting. I have good things to report. First, last week the didn't quite finish the mulch job, well they came back and finished it up, so it looks nice. Next time mum says she will remind them that even the area under the fevver feeders has to be mulched. The trumpet vine is just showing signs of life with new growth. Everything is slow this spring. The beginning of the tree trimming pile. I kept on mum and she did good, got the trees and shrubs in the back yard all done. Dead branches gone, shrubs thinned and shaped, bad stuff cut down. This is what mum had piled up from earlier, the little evergreen and the old trumpet vine stalks. Then she took down two smallish trees that were growing between our house and the neighbors. Mum does all of this by hand with a bow saw. No noisy chain saw for her! Mum pulled the one tree out farther to work on it. The pile of all the stuff by the street, then this past Tuesday, the village came and took it all away! Here is the robin's nest out front. We will keep an eye on it for you and try to provide updates as we can. The Bridge is getting fuller, two more have made their journey. 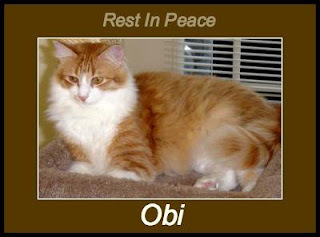 Obi from over at Forty Paws, yep, Jenny just left the other day. 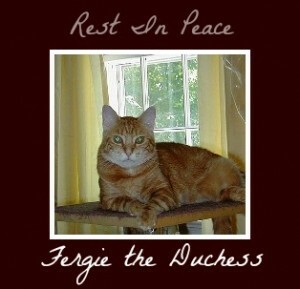 Fergie of the Whiskers and Purrs Gang. Mum worked hard Caturday, but took it easy yesterday. She readed all of her big pile of magazines. Cooked her chick-hen outside and we were waiting for some inside. We got some nice pieces of chick-hen AND mum let us lick her plate when she is done. Mum checked the robin's nest from inside. The fevvers are sitting there, so she didn't scare them away on Caturday.